Have you been injured in a slip or trip and fall accident? We’ll get you the compensation you deserve. Not every slip and fall victim is entitled to compensation from a property owner, but if you’ve fallen and been injured because a property owner failed to create a safe, obstacle-free environment, The Bennett Law Group can help you get the money you deserve to adequately cover the damages and compensate you for your loss. Slip, Trip and Fall injuries are one of the more common premises liabilities cases. Statistics show that 9,000,000 slip or trip and falls occur each year. This is more 25,000 slip or trip and falls per day. Slippery floors – either from water or some other liquid being spilled on them, or perhaps from the type of material they are made out of. Inadequate lighting – if you can’t see where you are going there is always a greater danger of tripping. If you or a loved one has sustained a Slip or Trip and Fall while on the property of another due to unsafe conditions and would like to speak with an attorney to discuss your options, contact us today for a free consultation. We have achieved significant results for our prior clients in handling Slip or Trip and Fall cases. If you have been injured while on the property of another, there are certain steps that you should take right away. First of all it’s very important to document the injury and to take pictures of the unsafe area where the slip or trip and fall occurred. You also need to file an incident report with someone on the property who is in charge, such as a grocery store manager or restaurant manager. Were there any witnesses to your accident? If so, ask for their contact information. You should seek medical attention right away. Sometimes the full extent of your injuries is not readily apparent, so it’s important to get checked out immediately and learn what injuries you are going to be dealing with that may not have surfaced yet. Also, it’s extremely important for you to keep all of your medical documentation, which would include reports, x-rays, cat scans, medical bills, hospital admission forms, etc. You should bring all of your documentation with you to your initial consultation with your attorney. You need to hire an attorney as soon as possible so that they can begin the process of collecting evidence, before it “disappears” or before the unsafe area is suddenly repaired. The attorney may employ certain experts, for example, an expert who is familiar with building codes in the state of Georgia, and who can testify on your behalf if necessary that the area where the accident occurred was not up to code. 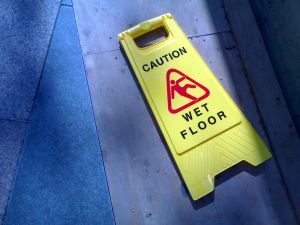 Slip and fall—or trip and fall—injuries are among the most commonly tried premises liability cases. If you are unsure whether or not you have a valid case, our Atlanta personal injury law firm will be happy to discuss your specific circumstances with you. Contact us online or give us a call at 404.541.9330. We look forward to your call.